Historically, Arrernte Catholic community, or Ngkarte Mikwekenhe community, has celebrated Mass at South Terrace Community Centre, across town from the main parish church. But since Holy Week last year, the two communities have shared the Eucharist together once a month. Fr Olivier says there was also a desire to bring the two worshipping communities together in a more inclusive way, while respecting the cultural differences that exist, maintaining the Arrernte form of Mass and the schedule every Sunday except the third Sunday when the combined Mass is celebrated. 'The Spirit moves in different ways, and last year, when we were celebrating the Year for Families here in the Darwin Diocese, it seemed like a good time to begin moving the two communities closer together,' he says. 'It wasn't easy in the beginning, especially because some of the older members of the Arrernte community had a strong historical and emotional attachment to the Ngkarte Mikwekenhe community centre, and even though we started worshipping togetheri in the big church, they didn't always feel welcome. But Fr Olivier says that after a year of regular monthly worship together at Our Lady of the Sacred Heart's 9.30am Sunday Mass, things are slowly starting to change. 'We don't hear so much anymore that people aren't feeling welcome', he says. To assist in making the Arrernte community feel at home in the big church, the Second Reading is read in the Arrernte language and Arrernte hymns are also included. ‘It’s still early days and we are trying to be sensitive to both groups. We want to be sensitive enough to allow both groups to grow together’, Fr Olivier says. Article first published In the Word, the eNewsletter of the Divine Word Missionaries’ Australian Province, March 2018. 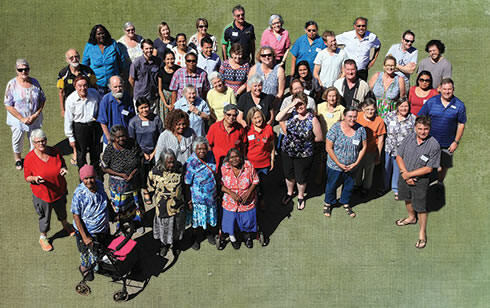 Women play a special role in organisations designed to meet the spiritual and physical needs of Aboriginal and Torres Strait Islander Catholics. This work of mothers, sisters, aunties, grandmothers and daughters will be recognised in Aboriginal and Torres Strait Islander Sunday celebrations as the National Aboriginal and Torres Strait Islander Catholic Council (NATSICC) has decided to use the same NAIDOC Week theme ‘Because of her, we can! 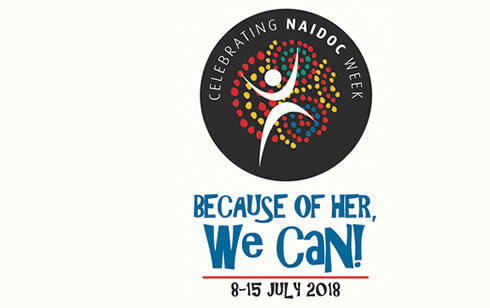 NAIDOC WEEK, which will be held from 8-15 July, will also celebrate the essential role that women have as active and significant role models at the community, local, state and national levels. NATSICC has developed a resource kit that highlights the work of Aboriginal and Torres Strait Islander women in the church and community by providing liturgy resources, stories of faith, prayer suggestions and youth activities. For more information on the Sunday celebrations, visit http://www.natsicc.org.au/2018-aboriginal-and islander sunday.html. NATSICC will hold an Assembly to celebrate and share culture and spirituality in the Catholic church in Australia, from 1 5 October in Perth. Entitled ‘Strong Faith. Strong Youth. Strong Future.’, the Assembly will celebrate young people. Images: The Arrernte Catholic community and Our Lady of Sacred Heart parish have come together to share the Eucharist. Ngkarte Mikwekenhe – South Terrace.